Almost like they do in the restaurants. And works for fish too. If you visit a restaurant with an open kitchen, pick a seat where you can see what the chefs are doing. Even if it’s a storefront diner-dive kind of place, you’ll pick up some good tips (not the money kind). There are two ways to add tomato sauce to a meal. The first is, cook the tomato sauce separately and spoon over your food. This is simple, efficient and works well if you make a good sauce. The second is, make the sauce in the same pan after cooking the main ingredient. The second method picks up the left over flavors in the pan from the first cooking. It would be a shame to waste the good flavors left in the pan. The other advantage of making a pan sauce is there won’t be a whole bunch of tomato sauce lying around the next day looking for a purpose. The pan sauce will just about be enough for the meal at hand. 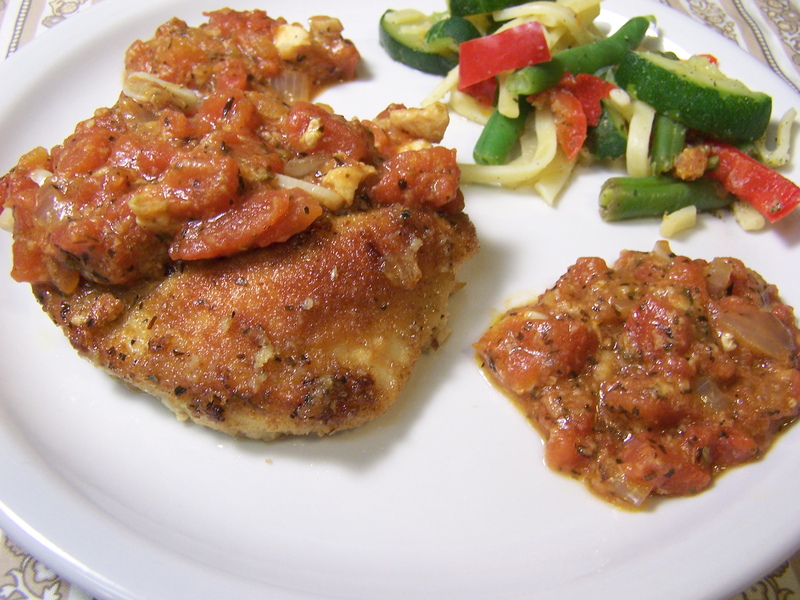 So here goes, simple skillet cooked chicken with a pan tomato sauce. Rinse the chicken breasts in/under cold water. Cut away any veins, membranes and other assorted bits of nastiness. Trim the chicken breasts to create a relatively uniform thickness. The technique will vary depending on the size of the chicken breast. First trim off any really thin edges and any hanging on bits and pieces. By careful horizontal cutting, trim down the really thick part of the breast. Dice up the trimmings and roll in the bread crumbs to coat. These will be become part of the sauce later. Coat the breasts with the bread crumbs. Cook the breasts in the olive oil in a frying pan, over medium heat. Turn once during cooking. The one turn method should give you a nice browned coated surface on the chicken. If the oil dries up while cooking, add some additional oil. When cooked through, remove the breasts to a plate. When the breasts are turned, add the coated diced breast trimmings to the pan. Gently turn these to cook while cooking the second side of the breast. Leave these in the pan when the breasts are removed. Add the diced tomatoes and onions to the pan. Raise the heat to medium-high. Mix the tomatoes into the pan drippings with a pan-safe spatula or similar utensil by gently scrapping along the bottom of the pan to loosen the drippings and whatnot. Stir in the basil, oregano, garlic, salt and pepper. By now there should be a pretty nice medium boil going on in the sauce. Continue this medium boil, stirring occasionally, while the sauce reduces to a nice thick sauce. Place a chicken breast on a dinner plate. Spoon the pan sauce over half the breast, remembering to show some of the nicely browned chicken. Spoon additional sauce directly on the plate. Add cooked vegetables to the plate if desired. This entry was posted on 01/21/2012 at 14:29 and is filed under Recipes, Recipes, food, cooking and related items. You can follow any responses to this entry through the RSS 2.0 feed. You can leave a response, or trackback from your own site. This looks absolutely wonderful. Delicious. Thanks. A little improvised lighting and keeping by finger away from the lens helped alot. I first did this with Tilapia fillets. It was equally good or better.